Synopsis: Routing of VLSI chips is an important, time consuming, and difficult problem. The difficulty of the problem is attributed to the large number of often conflicting factors that affect the routing quality. Traditional techniques have approached routing by ignoring some of these factors and imposing unnecessary constraints in order to make routing tractable. In addition to the imposition of these restrictions, which simplify the problems to a degree but at the same time reduce the routing quality, traditional approaches use brute force. They often transform the problem into mathematical or graph problems and completely ignore the specific knowledge about the routing task that can greatly help the solution. This thesis overcomes some of the above problems and presents a system that performs routing close to what human designers do. In other words it heavily capitalizes on the knowledge of human expertise in this area, it does not impose unnecessary constraints, it considers all the different factors that affect the routing quality, and most importantly it allows constant user interaction throughout the routing process. To achieve the above, this thesis presents background about some representative techniques for routing and summarizes their characteristics. It then studies in detail the different factors (such as minimum area, number of vias, wire length, etc.) that affect the routing quality, and the different criteria (such as vertical/horizontal constraint graph, merging, minimal rectilinear Steiner tree, etc.) that can be used to optimize these factors. 5. 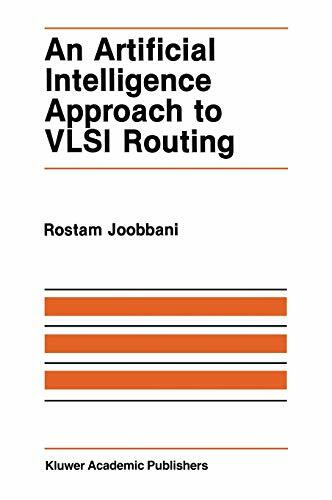 An Artificial Intelligence Approach to VLSI Routing (The Springer International Series in Engineering and Computer Science) [Hardcover] Joobbani, R.
6. An Artificial Intelligence Approach to VLSI Routing (The Springer International Series in Engineering and Computer Science) [Hardcover] Joobbani, R.